Sethu institute of technology along with YEI (Youth EXNORA International) has launched the SIT YOUTHEXNORA ECOCLUB on 8/10/11. Sethu institute of technology along with YEI (Youth EXNORA International) has launched the SIT YOUTHEXNORA ECOCLUB on 8/10/11 . YEI Madurai has joined hands with NSS of SIT, Kariapatti and college’s Quality Circle Team- OASIS to initiate the concept of green campus. During the Inauguration function, the Principal felicitated the gathering and chief guest MR.S.P.Ramkumar, Vice President YEI briefed about SIT YOUTH EXNORA ECO CLUB. The club was inaugurated, by giving the pot of emerging life to the QC co-coordinatorProf.A. Merline (ECE Department ), Mrs.Poomani @ Punitha QC Facilitator (CSE department ) , Mr.J.Kumaresen NSS Officer (ICE department )and the OASIS team members, by the chief guest S.P.Ramkumar& The Principal Dr.A.Senthilkumar. The main aim of the club is make SIT GREEN by various projects like solid waste management, campus cleaning and developing the youth. An awareness camp was conducted by the chief guest Mr.S.P.Ramkumar which motivated all of the students to move towards a greener environment and know their responsibilities towards the nature on the day of inauguration. A campus cleaning program was organized where all the waste was collected by the NSS volunteers. 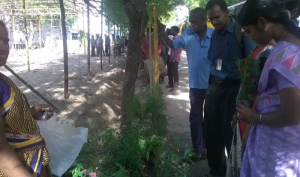 SIT ECO Club has organized a nursery stall on 16.09.2015.Nearly 200 plants were exhibited and all the faculty members, students, staff of the entire college premises visited the stall and purchased many plants on their interest. 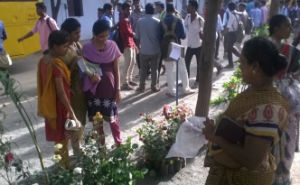 This stall was organized in order to promote plantation among all the members inside the campus. In order to make awareness about the OZONE Day, Signature campaign was organized by SIT ECO Club on 16.09.2015. 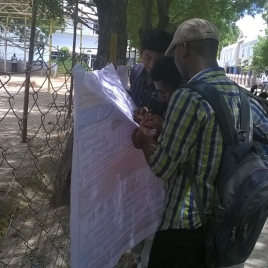 Many students, faculty members were actively participated in the signature campaign. The students, faculty members wrote many interesting quotes regarding the environment and the OZONE in the flex and signed. The students, faculty members wrote many interesting quotes regarding the environment and the OZONE in the flex and signed. A seminar on Carbon footprint was conducted on 18.09.2015 by SIT ECO Club.Dr.S.Murugesan Associate Professor School of Chemistry, Madurai Kamaraj University Maduraiwas invited and he gave a seminar on Carbon foot print and presented how to reduce carbon footprint and improve the environment. 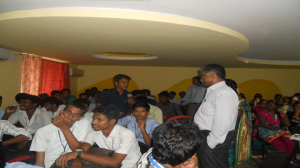 The III Year students of Mech , CSE , E&I , ICE and EEE were actively participated in the seminar and got benefit of it.